It was almost a bit of deja vu people would say, as the defending Canadian Champions would go back and do it again this time winning the title in Regina Saskatchewan. 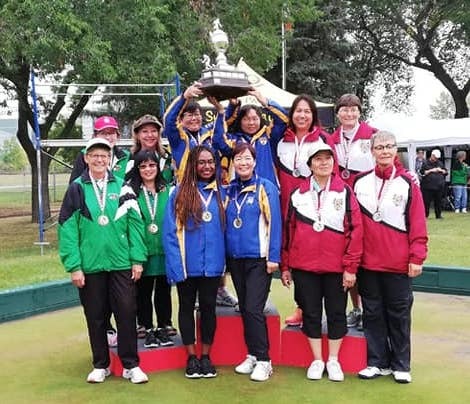 Skipper Josephine Lee would take her team of, Pricilla Westlake, Sarina Mak, and Gigi Chan and defend their title as British Columbia B defeated Ontario B 12-9 on a rainy Sunday afternoon at the Regina LBC. Having played a couple close games throughout the round robin, the BC B Team was head and shoulders in the field as they would cruise through the week with an 8-1 record with the only loss coming in the middle of the event to Alberta A losing 17-15. They wanted to go and defend the title as speaking before the event she wanted to go and win back to back Championships with her girls. Saying it and going and doing it are two different things. 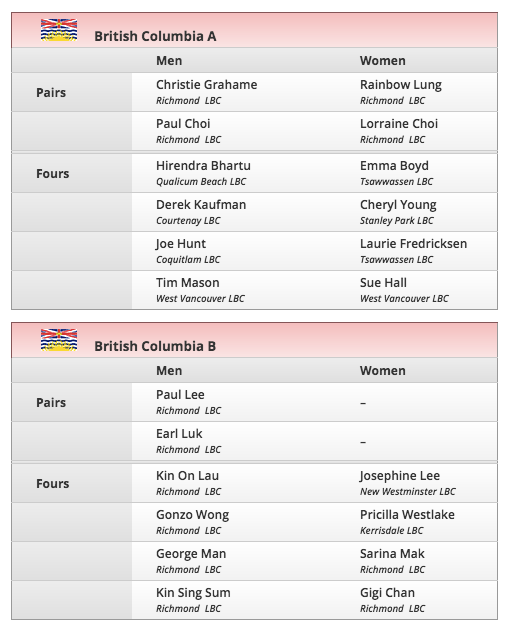 The other BC Team that would make the medal round was BC B Men’s Fours who would come up against a hot Manitoba Team that would end up beating BC 22-8. A great experience for the Team to make it to the Bronze Medal Match. Congratulations to all the competitors, volunteers and Umpires that made it a success. A special thanks to David Mathie who once again has given his time to Manage the Teams throughout the tournament. Also to George Cubiss who was the Head Umpire, as well as Umpires from BC including our own Annie Mathie. Everyone should be proud of our Athletes and Volunteers as they represented British Columbia well, both on and off the greens.